"SCVA sponsored festivals challenged me and my students. The experience consistently inspired us and validated our hard work." 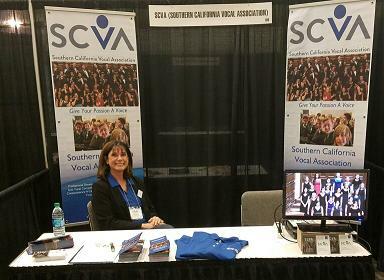 "Being in the SCVA Honor Choir was a life-changing experience; being with so many talented, motivated students and singing high level music with a world-class conductor is inspiring." "Thank you for the continued high level of expectations, work ethic, and professionalism that SCVA continues to promote and provide for us." "This overall was a very good festival. It ran very smoothly and the judging was good." "The festival was well-run and had a positive environment." "FANTASTIC first festival experience. Proud to be a part of SCVA. Thanks for everything!!" "Very enjoyable and educational event for all of my singers. Thank you." "My first SCVA Festival - had a good experience." "Thank you for a wonderful festival." 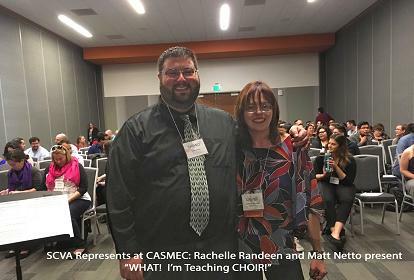 CMEA is proud to announce the creation of the Dr. Randi Carp Choral Music Education Scholarship, to be presented annually to a graduating high school senior who has chosen to pursue Choral Music Education as their career. Click here for more information and to access the application forms. Click here to Join, Renew or Update your SCVA membership for the 2018-2019 school year.